Previous Mukombwe, 40, is a blissful and high-spirited mother of eight beautiful children, four boys and four girls. She is married to Airman, 46, who is a peasant farmer. Growing up in a poor, remote village, Previous was forced to drop out of school and be married at the age of 17. “I didn’t want to get married but had no choice,” she says. Despite being married to a very caring man, things didn’t go as planned in the first years of their marriage. “I tried so hard to get pregnant but failed. I suffered from severe stomach problems,” Previous says. After ten long years of trying, Previous conceived at the age of 27. Even though the couple was excited about starting a family, they didn’t know about safe birth/child spacing. Living in a culture with a belief that the number of children and cattle determines the level of one’s wealth, Previous had seven children within a space of 10 years. During this period, she was either pregnant, breastfeeding or both. Unknowingly, this situation severely affected her health and her children’s well-being. “We did not know how having many children would affect our lives. We were in the dark. My husband and I had difficulties in providing food, clothing, beddings and school requirements for our children,” she recalls. A few years ago, the tables turned for Previous when she was pregnant with her seventh child. She experienced severe complications that almost took her life and she was ‘forced’ to deliver from a clinic. “Before I was sent home, the nurses introduced me to Hope, a community health volunteer with World Vision and a member of the Safe Motherhood Action Group (SMAG),” Previous says. “My life has never been the same from the time I met Hope,” she adds. Hope was trained and equipped by World Vision to provide Timely Targeted Counselling (TTC) to expectant and lactating mothers. TTC was developed by World Vision approach to help save lives. Previous appreciates the comprehensive and trustworthy counselling that Hope provides. Hope visited Previous and her husband at home and consistently provided lifesaving information on healthy preg-nancies, importance of delivering at a health facility, child spacing and how to best care and feed infants. Despite the existence of myths in their community, Previous and Airman eventually understood the importance of child spacing and how it could positively impact their lives. 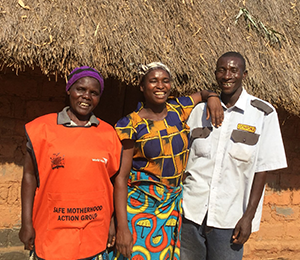 “For the first time in my life, we practiced family planning. I enjoyed being pregnant and was able to stay for over two years before falling pregnant again. My body felt rested and I had the strength to care and nurture my children. My husband, too, was able to provide the family’s basic necessities,” she says. “Thank you, World Vision for training SMAGS. They have made motherhood more enjoyable for me,” she says, smilingly. Even in remote Zambia, SMAGS are helping to promote child spacing, which helps ensure that every pregnancy is planned, every child is wanted, and every mother has the best chance of survival.